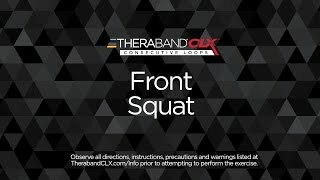 Begin by place each foot into the end easy grip loops of the CLX. Then feed each arm through the two center easy grip loops with one seal between. Maintain your arms with elbows bent and hands crossed at shoulder level as you slowly squat until your thighs are parallel to the floor. Without leaning forward slowly return to a standing position maintaining a neutral back and neck alignment.